“Listen. I don’t think I can emphasize how much Sleep and the City changed our lives. For the past five years we’ve had to lay next to them until they fall asleep. Every night. "I can't thank you enough for all the advice, but mostly for installing the confidence in me to be able to understand & troubleshoot with my son's sleep schedule and how to respond appropriately. Working with you has been literally life-changing! "Props to the amazing Lauren Olson (aka sleep goddess)...7 days ago I'd have never dreamed of having an easy time putting Amelia to bed. One week later and she just fell asleep a mere 5 minutes after lights out. If you know my child or our sleep story you know this is nothing short of a Christmas miracle! "Shiloh is 5 months old and is doing incredible at night! She has dropped her feedings and sleeps most nights up to 12 hours without waking—I can't believe it! 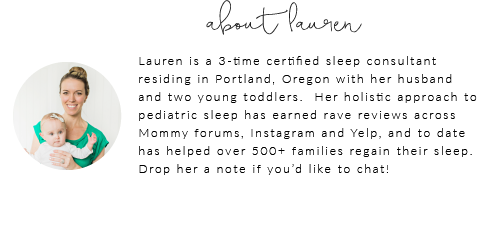 As a result, her naps have become longer during the day as well—it has been such a pleasure to work with Lauren and Sleep & the City!"